Teams were grouped based on ratings and had an opportunity to move up a division or two during the first day. This year, the teams were divided into a total of 10 divisions including an Elite Division. There were plenty of exciting matches to watch, but the finals of the top division came down to Team JOOLA and Atlanta TT Academy 1, both of which were stacked with high-level players from various countries such as Argentina, Austria, Canada, China, Germany, and the US. Between the two teams, there were several Olympians, multiple National Team members, and even a former World Champion. In the end, it was Atlanta TT Academy that prevailed three-games-to-one, but the matches were definitely nail biters with two of Atlanta TT Academy 1’s winning matches hitting deuce in fifth game. A powerhouse of international superstars, Team JOOLA was armed with National Team Members from two continents! 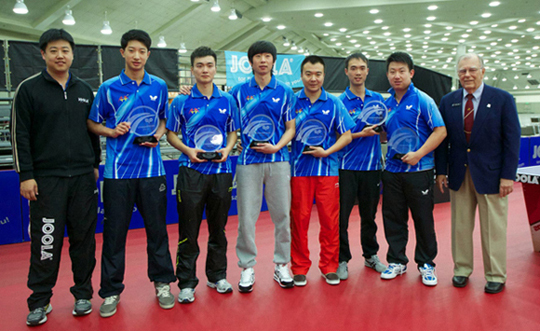 Defensive specialist Liu Song of Argentina (WR#123) returned this year after winning the Men’s Singles title at the 2011 Pan American Games in Guadalajara, Mexico last year with fellow chopper Chen Weixing of Austria (WR#29), who holds multiple European titles and was formerly ranked in the Top 10 in the world. Daniel Habesohn (WR#72) also hails from Austria and won the European Championships Doubles title just last month! Lastly but certainly not least, former World Champion and five-time Olympian Joerg Rosskopf of Germany, who currently serves as Germany’s National Team Coach joined Team JOOLA as both player and coach. A combination of National Team members from the US, Canada, and China, this team was already expected to be a top contender this year. Timothy Wang is a 2012 US Olympic Team member and 2010 US Men’s Champion, while Zhen (Eugene) Wang of Canada is a 2012 Canadian Olympic Team member and the 2012 US Open Champion. JiKang Liu is a current Chinese National Team member and Kewei Li is a chopper and former Chinese National Team member. Originally from China, Yijun (Tom) Feng, is currently training in Atlanta, Georgia. King Pong – Queens, representing King Pong Soho (a new table tennis club in NYC), was the top women’s team at the event and placed in the Top 8 of the Elite Division. 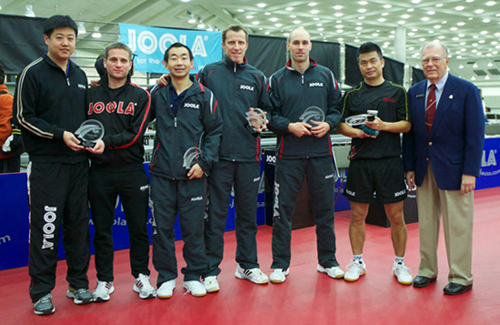 Based in New York City, this team comes from a diverse background of table tennis success stories. Yue (Jennifer) Wu is a former Chinese National Team member from Beijing and a 2016 US Olympic Team hopeful. Originally from Hungary, Dora Kurimay, is former Hungarian National Team member and junior champion who defeated the reigning US Men’s National Champion at the US Open earlier this year! Hiroka (Vivian) Ooka is a former Japanese National Team member, but before that she was China’s Junior National Champion at just 16 years old. Another top player from the Big Apple, XinYue (Taylor) Wang currently coaches at the largest table tennis club in NYC and her student Annie Guo, was a 2011 US Junior National Team member. For more results, please visit our results section! We hope you enjoy the photos and videos! Thank you to everyone who made this event possible – especially the Baltimore Convention Center and Hyatt Regency Hotel for 15 amazing years. We are sad to leave Baltimore, but we look forward to seeing everyone at our new location in National Harbor next year. Learn more about next year’s event at www.joolateams.com.